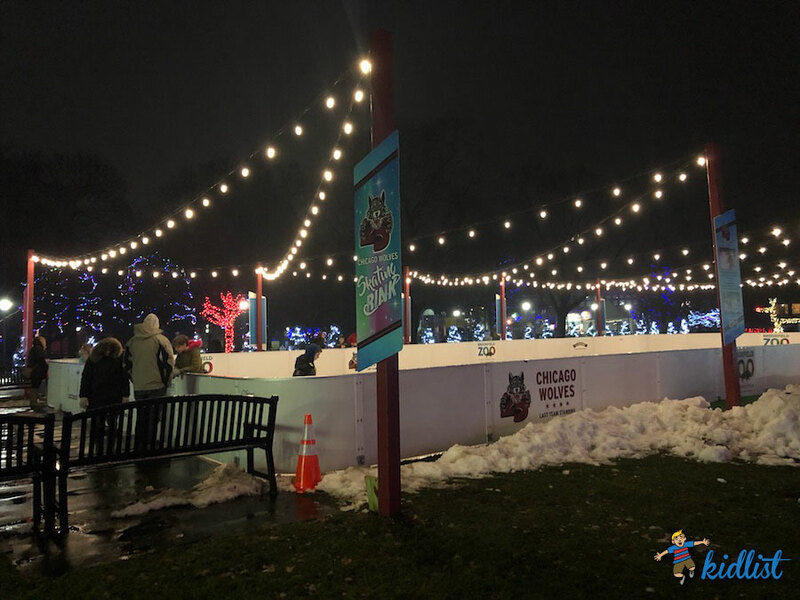 Brookfield Zoo invited our family to the opening night of Holiday Magic so we could give you the inside scoop and we really enjoyed our time there! We spent several hours walking around the zoo, enjoying the special entertainment, model railroad, free exhibits, photo opportunities, and more. Keep reading for the breakdown of all you will find there and where to go when you get there. 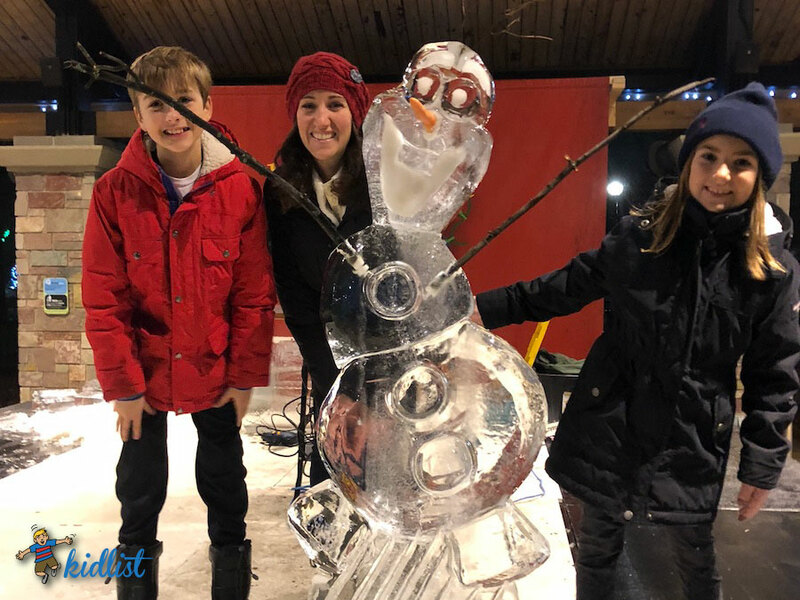 Also, don’t miss the sections on where to park, how to stay warm, and where to get those light bulb necklaces that seem to be the staple of Holiday Magic each year! The following can be found in the pavilion area between the carousel and big fountain (Roosevelt Fountain) in the center of the zoo. Enjoy various entertainment indoors, such as singing, dancing (including one of our wonderful Kidlist sponsors, Jo’s Footwork Studio on December 15), and cultural performances. Click here for the full schedule. 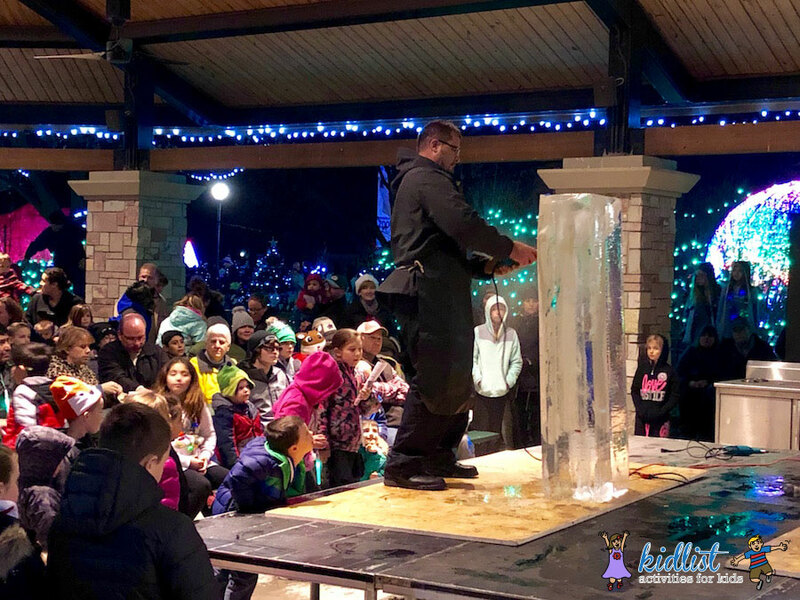 Watch professional ice carvers demonstrate their craft and skill at carving different shapes from huge blocks of ice at 6:00, 7:00, and 8:00 pm. Matthew Scherer entertains the crowd with his magic tricks. 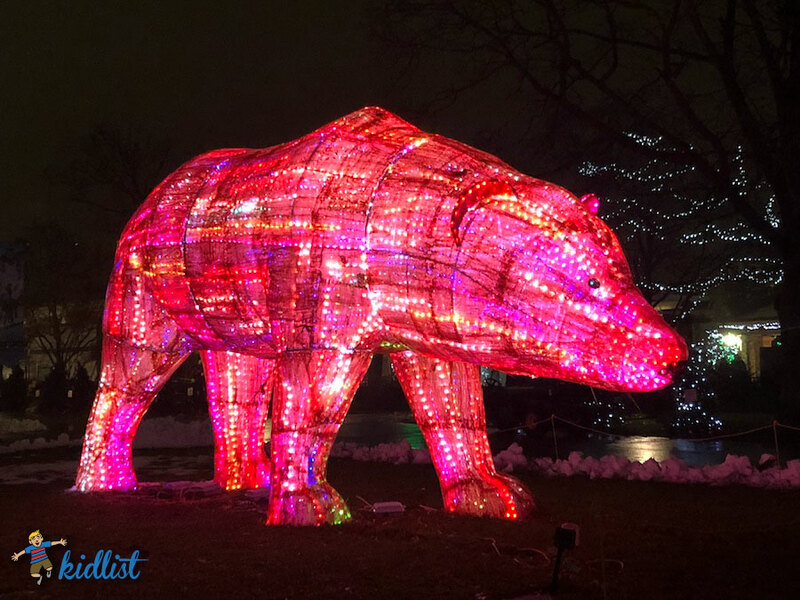 There are over 1 million LED lights around the Brookfield Zoo! The spot lights above the Roosevelt Fountain are also pretty cool. There is also a 41-foot talking tree. So walk up to the giant lit tree by the carousel and talk to it. You just might hear a response! 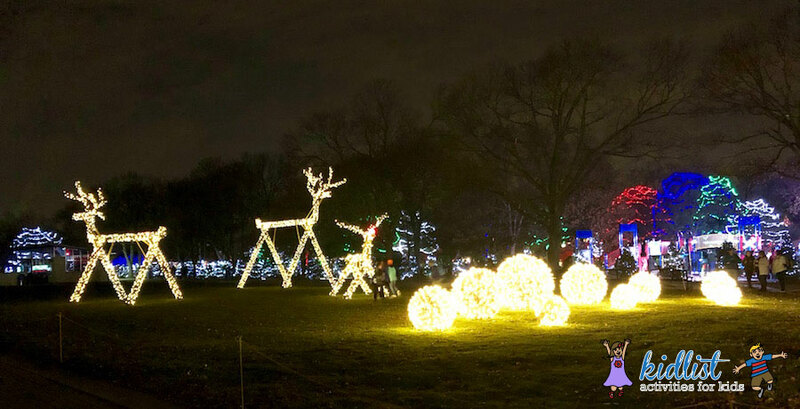 These huge lit-up reindeer in the East Mall were fun to see on our way towards the dolphins. There’s a huge polar bear near the carousel. This light show set to music is near the exit of Tropic World in the West Mall that is fun to watch. Triangular shaped trees change colors and patterns depending on what song plays, ranging from Christmas classics to upbeat jams. Take your own photos in this huge orb with color changing lights! Here’s an idea: have your kids stand about 3-4 feet in front of the wall of lights, change your phone to portrait mode, and snap a picture. The brightly colored lights blur in the background and make for a unique shot. The new glice skating rink is beautiful at night, with lights strung overhead. Skate rental is available for $5. Glice is a synthetic surface that’s eco friendly and doesn’t depend on outside temperatures or refrigeration. It’s a unique surface to skate on! Head to the Riverside Room to marvel at a room full of model trains, tracks, and towns. 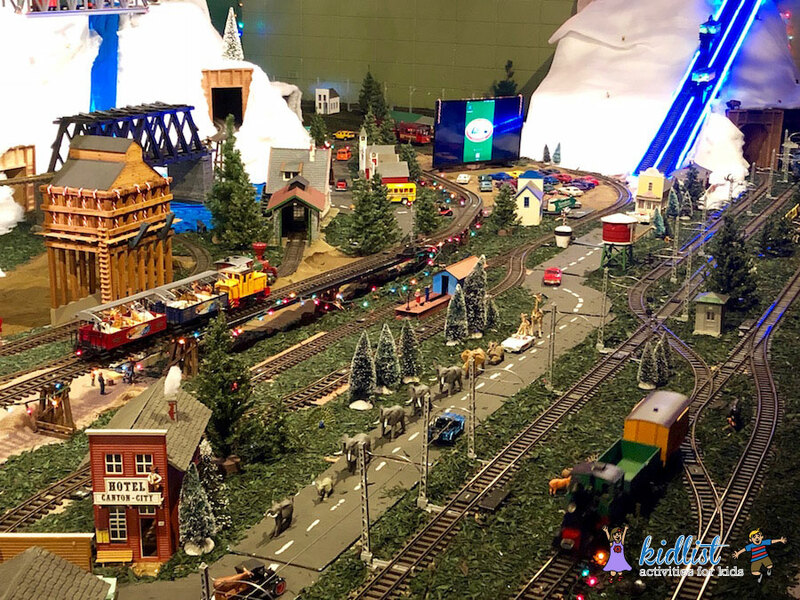 The display is called Santa’s Animals Holiday Express Model Railroad because there are several animals to search for, including a giraffe driving a car! There is lots to see and several trains and other vehicles circling the tracks. For whatever reason, we had a difficult time finding where this was. If you are looking at BZ Red Hots (the large restaurant next to the Seven Seas), walk around the building on the right side. There is a LGB (Lehmann Gross Bahn) Model Railroad Club sign with a ramp going down to the Riverside Room door. 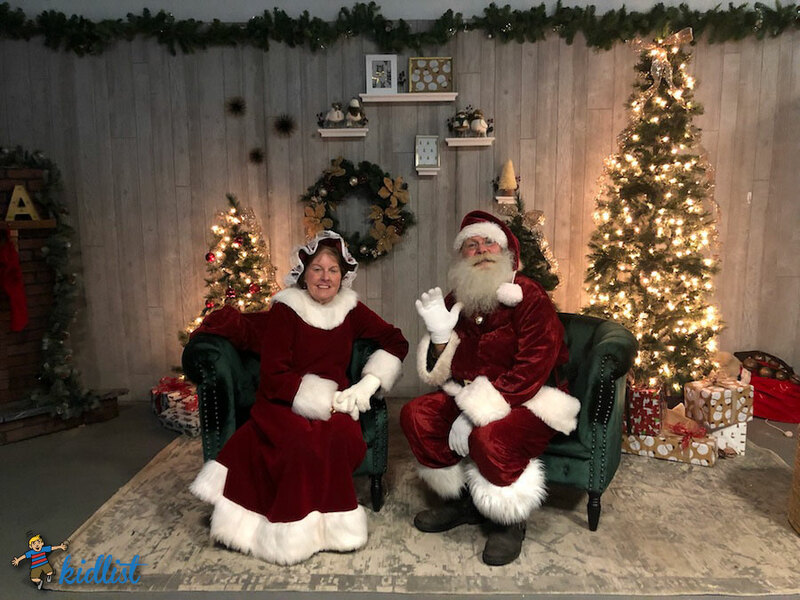 You can take pictures with Santa and Mrs. Claus in the Seven Seas Underwater Viewing area from 4:00 – 8:30 pm through December 23, 2018. The Hamill Family Play Zoo and Wild Encounters both usually charge a separate entrance fee, but are free during Holiday Magic. 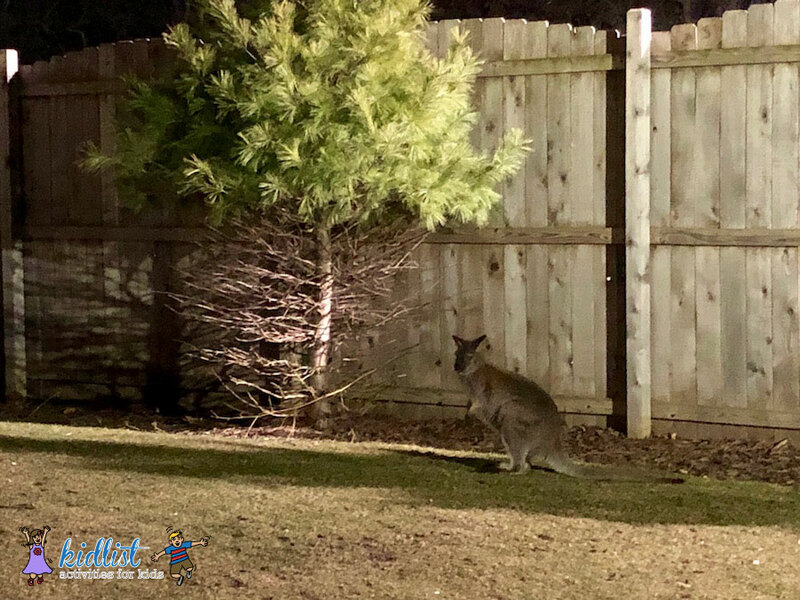 Some of the animals are outside at Wild Encounters, including the wallabies, but the parakeet aviary is closed. We only came across two things with an extra fee (besides souvenirs and food): there is an extra dolphin show at 6:00 pm at the Seven Seas, and there is cookie decorating at BZ Red Hots. Many people get in the holiday spirit at Holiday Magic by wearing fun light bulb necklaces. You will find them at any one of several stands throughout the zoo. 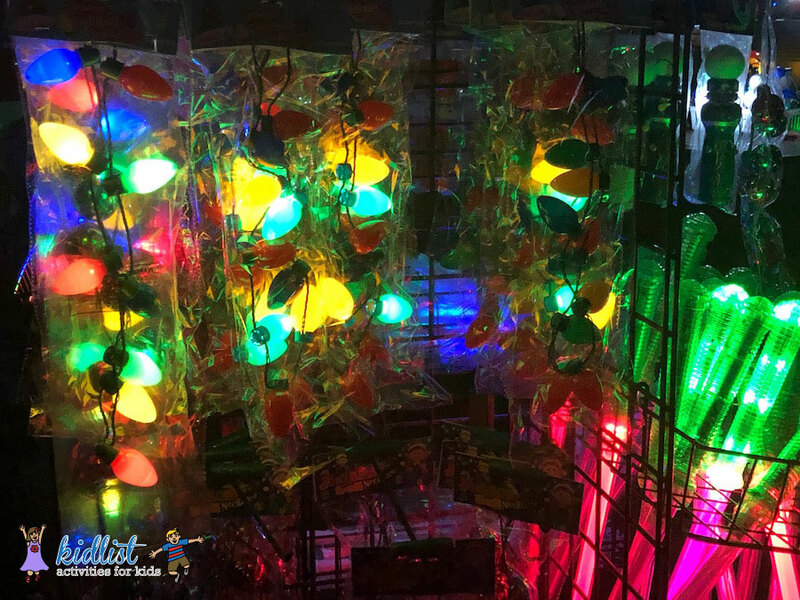 (The stands also sell other illuminating options as well) The necklaces are $10 each, or you can plan ahead and buy them online for $6.99. Click here to buy on Amazon. ComEd will also be handing out LED necklaces during Holiday Magic that resemble glow sticks. We found them inside the Holly Jolly Theater in the pavilion area. All of the restaurants and shops are open and are very warm inside! The indoor exhibits are also open until 8:00 pm during Holiday Magic. We are a big fan of the South Gate because of the shorter distance to the entrance, but be prepared for crowds! There is overflow parking at the adjacent high school and grass area once you pay at the parking gate. We also saw people walking from the surrounding neighborhood blocks, but that is a much further walk than I would be up for with little kids. Holiday Magic is included in general admission, which is always free for members. Not a member? Save $1 per ticket when you order online! Want to See More Lights? 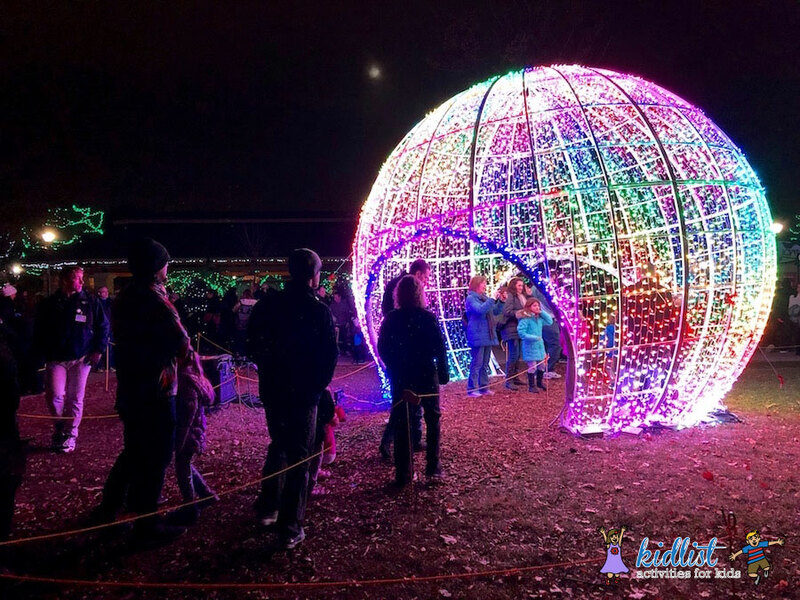 Check out our list of Best Christmas Lights in the Western Suburbs while you are in the area! Need Places to Go with a Baby or Toddler? Look Here! 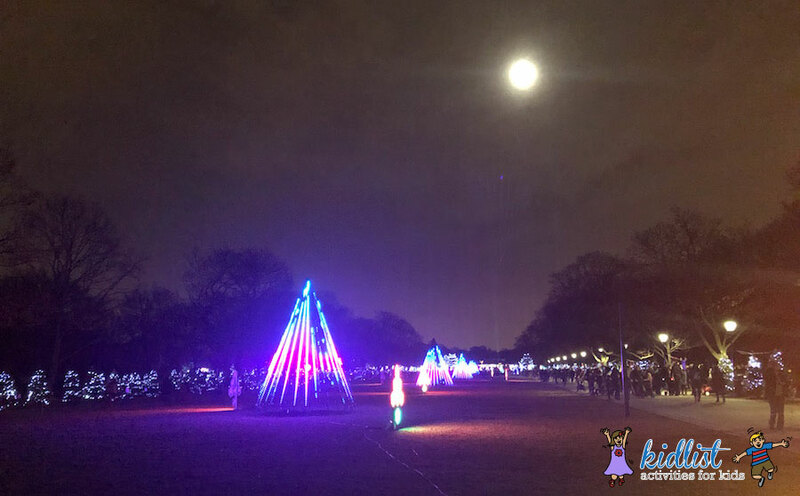 1 Comment on "Insider’s Guide to Holiday Magic at Brookfield Zoo"
I live in Brookfield and have a few tips: If the weather is nice come early as in before dark. This past weekend the line to get in the zoo parking at about 2:30 was almost non-existent, by 4:00 it was blocks long and after 5:00 it was backed up a mile in every direction. There are several hundred community Christmas trees decorated and they are better viewed in the daylight to see all the cute ornaments. 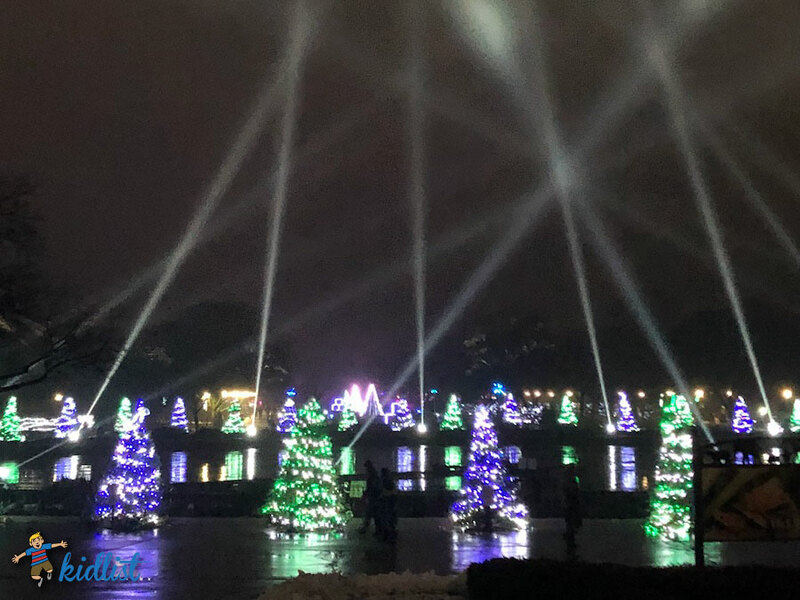 The zoo does not close and reopen for Holiday Magic so once you are there you can stay as late as you want once it gets dark you can enjoy the lights and be on your way home beating the traffic leaving the zoo as well. Please Please do not park in the neighborhood! The streets are old and narrow and can not accommodate that much parking. The streets nearest to the zoo are zoned parking and you need parking sticker for that zone. Brookfield is dark with not a lot of streetlights so the sides that indicate this are not easily read as their usually one small sign at one end of the street. You will come out to a $35 ticket. The lightbulb necklaces can also be found at Five Below stores.